A new argument has just been added to the growing case for graphene being bumped off its pedestal as the next big thing in the high-tech world by the two-dimensional semiconductors known as MX2 materials. 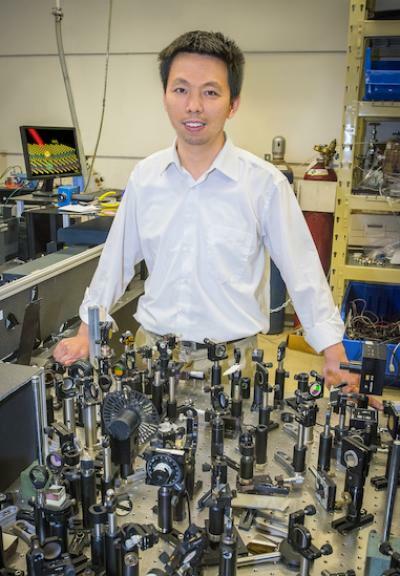 An international collaboration of researchers led by a scientist with the U.S. Department of Energy (DOE)'s Lawrence Berkeley National Laboratory (Berkeley Lab) has reported the first experimental observation of ultrafast charge transfer in photo-excited MX2 materials. The recorded charge transfer time clocked in at under 50 femtoseconds, comparable to the fastest times recorded for organic photovoltaics. "We've demonstrated, for the first time, efficient charge transfer in MX2 heterostructures through combined photoluminescence mapping and transient absorption measurements," says Feng Wang, a condensed matter physicist with Berkeley Lab's Materials Sciences Division and the University of California (UC) Berkeley's Physics Department. "Having quantitatively determined charge transfer time to be less than 50 femtoseconds, our study suggests that MX2 heterostructures, with their remarkable electrical and optical properties and the rapid development of large-area synthesis, hold great promise for future photonic and optoelectronic applications." Wang is the corresponding author of a paper in Nature Nanotechnology describing this research. 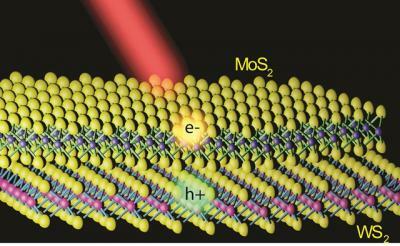 The paper is titled "Ultrafast charge transfer in atomically thin MoS2/WS2 heterostructures." Co-authors are Xiaoping Hong, Jonghwan Kim, Su-Fei Shi, Yu Zhang, Chenhao Jin, Yinghui Sun, Sefaattin Tongay, Junqiao Wu and Yanfeng Zhang. "We're also interested in controlling the charge transfer process with external electrical fields as a means of utilizing MX2 heterostructures in photovoltaic devices," Wang says.